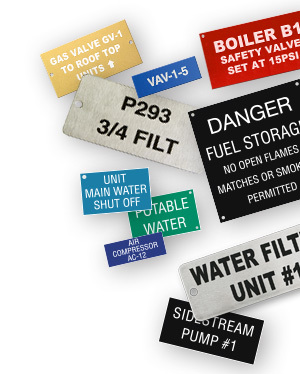 A leading manufacturer of nameplates, PipeMarker.com produces over 100,000 custom laser etched and engraved nameplates each year. Customers turn to us for our easy-to-use custom tool which allows users to modify nameplates to their desired configuration. It’s also possible to upload a list of nameplates using an Excel, Word, PDF, or CSV file (see product page for further instructions). Choose from three durable materials and two different printing methods: engraved plastic, engraved phenolic, and laser etched anodized aluminum. Each option comes with specific benefits unique to the material and manufacturing process. Both engraved nameplates and laser etched nameplates are manufactured and distributed from our state-of-the-art facility in Garfield, New Jersey. This means your new products are shipped as soon as they're ready. Find your nameplate accesories here. 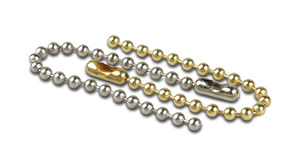 From brass or stainless steel screws to beaded chain, jack chain, or S-Hooks in brass or stainless steel, we have the solution for your nameplate mounting needs. Write-On Tags are blank tags used to quickly and easily identify any area. Constructed from durable, 15 mil thick outdoor grade vinyl, these blank tags work well in wet areas where paper tags won't last. Convey any message simply by writing on them with a permanent marker. Tags are colored on both sides and have 1 brass grommeted hole. Sold in packages of 25 tags.